Today I am going to introduce to you Radical Skincare. Radical Skincare, and its TrylacelTM technology, is the most powerful skincare line available that is clinically proven and designed for all skin types including sensitive skin. Its the best of the best in antioxidants and anti-aging ingredients that use TrylacelTM technology to keep Radical Skincare potent and powerful to deliver results. This proprietary technology combines multiple antioxidants, anti-aging active ingredients, and soothing ingredients to deliver the best in protection and repair for all skin types. It maintains stability and potency of actives to deliver radical results. Protects ingredient complex with Lipid Bi-Layer resembling a cell membrane. Lipid Bi-Layer composition helps to deliver functional materials to the sites where they are needed. Now let me introduce some of their upcoming products. ADVANCED PEPTIDE ANTIOXIDANT SERUM has been enriched with 13 ultra-high-performance anti-aging active agents, including 2 hexapeptides. They include triple action dipalmitoyl hydroxyproline, anti-glycation decarboxy carnosine, Argan extract, and 2 hexapeptides. Many were meticulously chosen for their action on two or even three phenomena on which aging has an impact. This cream is really rich and yet does not feel oily at all after being applied to the skin. You can tell the high amount of anti-oxidants inside this cream due to its yellowish colour of the cream. A white cream will only shows the low content of the anti-oxidants. Radical skincare really put all the best few anti-oxidants into 1 cream! MULTIBRIGHTENING SERUM treats all causes of blemishes and uneven complexions. It works throughout the life cycle of melanin, the main source of skin pigmentation, and has 7 targeted actions enabling it to prevent and repair all pigmentation disorders. It works as a skin ‘scrub’. Enhanced with a chain of invisible mineral filters, the SPF30 SKIN PERFECTING SCREEN 100% non chemical sunscreen provides a multi- function solution to protect the skin against UV rays. In addition to its capacity for defending the skin, the SPF30 SKIN PERFECTING SCREEN acts as anti-aging skincare and helps reduce the appearance of wrinkles and to conceal imperfections. It is an essential complement to all the Radical Skincare creams, to be used on face, de?collete? and hands. over make-up when skin is exposed to the sun. providing daily SPF30 protection against UV rays in town and in the country, with a powerful antioxidant complex. providing the appearance of a healthy glow, enriched in light-reflecting pigments. These pigments are contained in an encapsulated photoluminescent diamond core and are capable of redirecting light. Wrinkles and imperfections appear less pronounced. The SPF30 SKIN PERFECTING SCREEN’s ultra-light texture makes it easy to apply and to use with any type of make-up. The Radical Skincare Instant Revitalizing Mask is the ideal product for the skin: it delivers the nutrients necessary for hydration and regeneration while teaching it to breathe, stock up on energy and optimize its oxygen resources. The Instant Revitalizing Mask delivers a complex of natural active ingredients to the skin, helping to optimize oxygen resources for a lasting youthful glow, stimulating energy production and simultaneously controlling oxidation reactions. Hydration, Oxygenation, Stimulation and Vitamin supply are the main roles of this multi-functional mask, which also contains Radical’s TrylacelTM technology to soothe, repair, and protect the skin. Looks at the bubbles forming! This mask will surely inject enough oxygen into your skin. Exfoliates, firms, and reduces pores size. Helps promote cell turnover and accelerate Radical Skincare performance. 4 in 1 treatment: helps to reduce wrinkles, puffiness, discoloration, and hydration. Reduces wrinkles, hydrates, and evens skin tone. Formula boosts skin firmness and elasticity. Instantly tightens, firms, brightens, and improves elasticity. The most anticipated product that I cannot wait to try would be the SPF30 Skin Perfecting Screen! This sunscreen really feels comfortable on the skin without the tackiness and stickiness. Guess i have to wait until June to try that product! 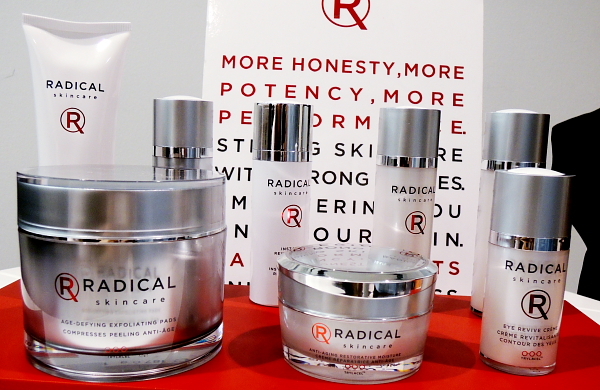 Hope you like this first glance into the new products from Radical Skincare line.